This one takes the Unsung Sewing Patterns award for Justly Forgotten Economies. I can think of few sewing tasks grimmer than cutting down old stockings in order to sew them up again. That said, this pattern raises some interesting questions on clothing usage. Did people re-use only stockings from their own households, or could one buy used stockings for just this purpose? Was it considered acceptable to use single stockings and match them up as best one could (easier with black, of course, than with tan or other colors)? Did ladies do this as part of charitable work to provide clothing to the poor, particularly for children? 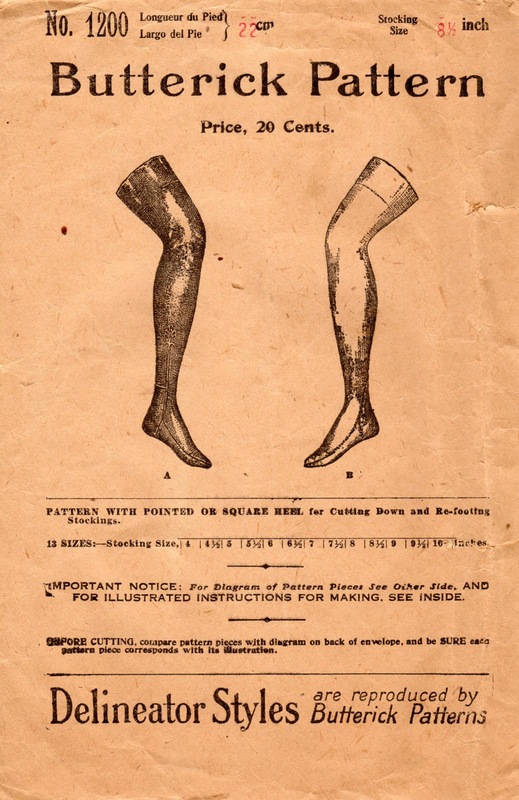 According to Clothing - Choice, Care, Cost, published in 1920, the cost of hosiery in general almost quadrupled during World War I. 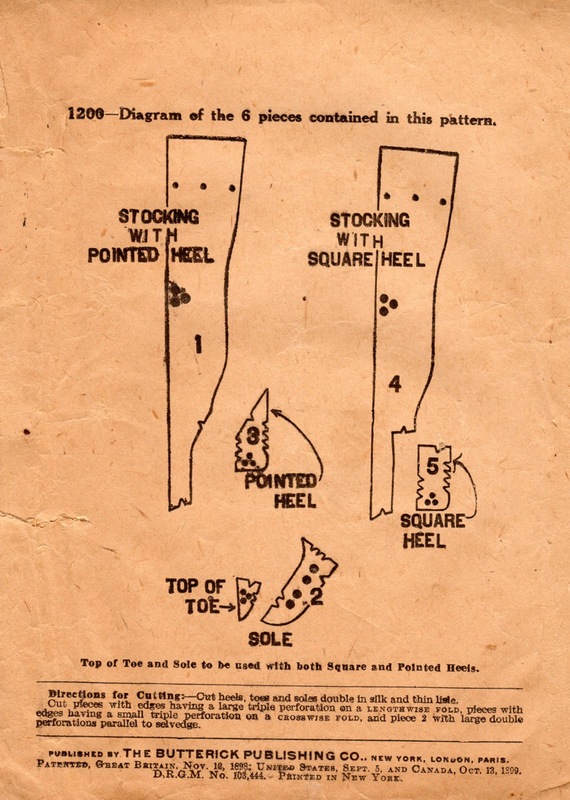 The "make do and mend" efforts of World War II are still well known to us, but this pattern may be evidence of the same type of effort during the previous war. This book also mentions that factory seconds stockings could be purchased inexpensively - these may also have been candidates for cutting down. 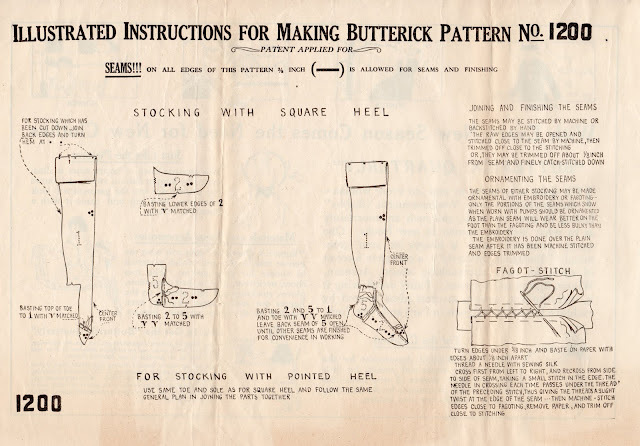 Although the instructions indicate that the stockings could be sewn on the machine, I think machine stitching would be heavy-looking and would be uncomfortable, particularly in the feet where the rather stiff seams might rub. 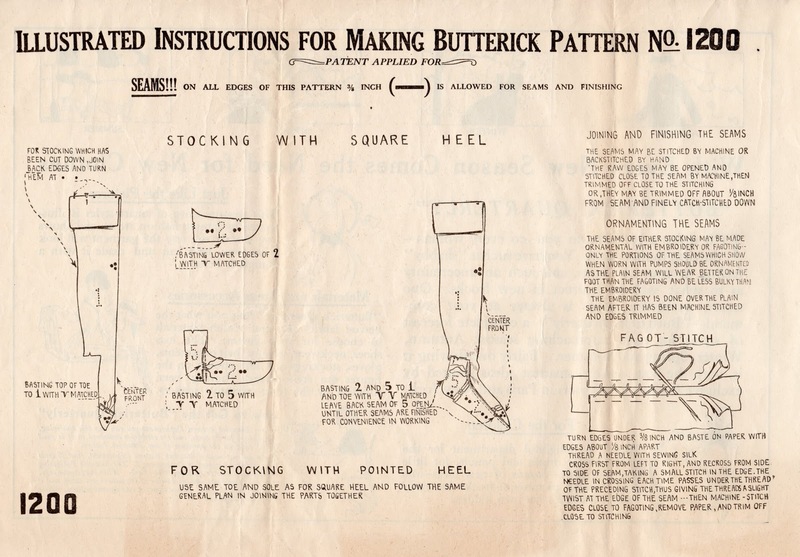 The envelope indicates that this pattern could be used for re-footing stockings, but the instructions themselves are silent on this point. I'm exhausted just thinking about the amount of work that would be involved in making over stockings, especially since I imagine that the revised stockings might not last all that long, so revisions could be a never-ending chore. Is that a children's pattern? In vintage stocking sizes an 8 1/2 would be for a very small foot. Cutting down adult stockings to a children's size would make an awful lot more sense. I *love* your blog, by the way. Keep 'em coming! I find it interesting that this was for re-doing stockings, not starting from scratch. And I wonder what fabrics would have been used. My grandmother talked about her mother re-footing socks. That would have been the right era of the article. Hmmmm...this really isn't a bad idea. Don't you get so mad when you poke a hole in the toe of a brand new pair of hosiery? It does look like a ton of work, but they didn't have the Internet back then. In the era of "mend and make do" and hand me downs, this all makes sense. Lots of work too! And I thought my mom teaching me how to darn stockings/socks was bad enough! But stocking prices quadrupling during WWI coupled with the shortages/rationing during that period would be enough of an incentive for many folks during that time, esp in the northern states. Fascinating as usual! Thanks! Here in Britain there are knitting patterns for making wool stockings. I can see the point of re-making those, as the knit can be pulled out and re-done with new thread. I can't imagine trying to cut and sew nylon stockings, however - they would just be a mass of runs, surely? Nylons are actually pretty late-period; I think even silk sheers are post-WWI (no point to sheers pre-flapper when your skirt covered your legs anyway, right?). And sheer stockings weren't all that "respectable" when they were first available, either . . . . These would have been wool or cotton; I actually owned, several years ago, a pair of real-live cotton stockings in an effort to wear "normal"-looking hose in a climate utterly non-conducive to artificial fibers (effort abandoned after very short time in favor of knee-high nylons under longer skirts, which I prefer over short ones anyway; the cotton was too thick to fit under the shoes I had then) and the cotton-knit fabric would have been _just_ possible to cope with, doing something like this, _if_ I were used to darning holes anyway. I don't re-foot them, but I do repair holes in the toes on my stockings with a little hand sewing. Tights are expensive! I picked up this habit from having to do this at work for actresses when the budget doesn't allow us to buy them more tights. In her biography Margot Fonteyn talks about the women who kept the dancers' tights in repair during WWII. I expect that by the end of the war the feet were mostly darns on top of darns.